The goal of this article is to showcase the usage of SPI usage with keycloak. For this, it is illustrated with a very simple SPI example which an event listener. cd /keycloak_4.5/distribution/keycloak-4.6.0.Final-SNAPSHOT$ sh bin/jboss-cli.sh --command="module add --name=org.keycloak.examples.event-sysout --resources=~/keycloak_4.5/keycloak/examples/providers/event-listener-sysout/target/event-listener-sysout-example.jar --dependencies=org.keycloak.keycloak-core,org.keycloak.keycloak-server-spi,org.keycloak.keycloak-server-spi-private"
sh bin/jboss-cli.sh --command="module add --name=org.keycloak.examples.event-sysout --resources=~/keycloak_4.5/keycloak/examples/providers/event-listener-sysout/target/event-listener-sysout-example.jar --dependencies=org.keycloak.keycloak-core,org.keycloak.keycloak-server-spi,org.keycloak.keycloak-server-spi-private"
Optionally you can also specify to save events in the database. * and other contributors as indicated by the @author tags. 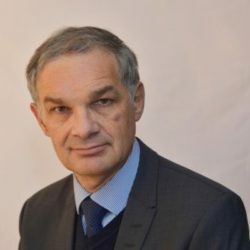 KEYCLOAK_HOME/bin/jboss-cli.sh --command="module add --name=org.keycloak.examples.event-sysout --resources=target/event-listener-sysout-example.jar --dependencies=org.keycloak.keycloak-core,org.keycloak.keycloak-server-spi,org.keycloak.keycloak-server-spi-private"
Then start (or restart) the server. 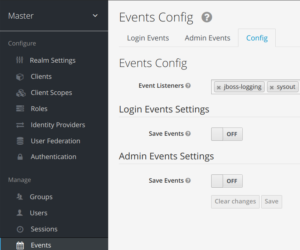 Once started open the admin console, select your realm, then click on Events, followed by config. Click on Listeners select box, then pick sysout from the dropdown. After this try to logout and login again to see events printed to System.out.